The national symbol of the United States is a bird that commonly frequents the Ridgefield National Wildlife Refuge, especially in the winter. That bird is the American Bald Eagle. 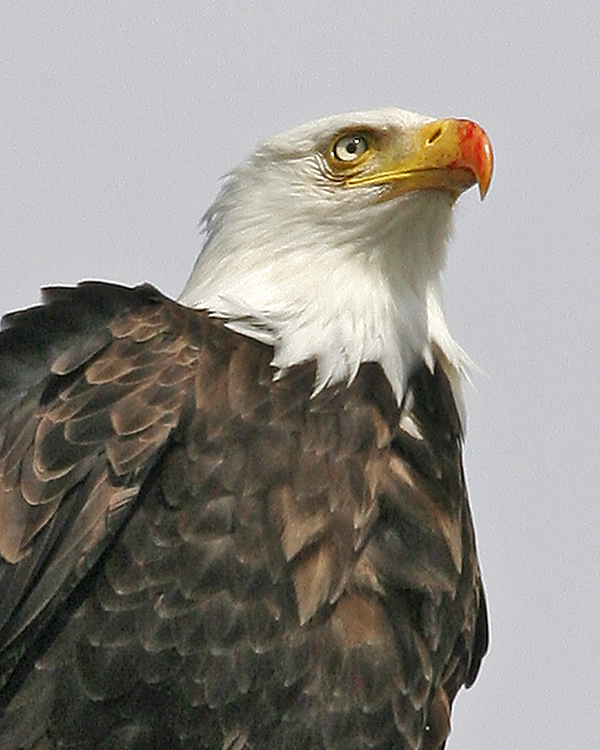 The Bald Eagle is the only eagle that is unique to North America. As I write this, I am sitting in the Visitors’ Station in the River “S” Unit of the Ridgfield NWR. In looking out the rear window, I can see an Eagle’s nest about 400 yards away from me between Lake River and the last part of the Auto Tour Route. Two adult eagles are perching there, one on the nest and the other on a branch supporting the nest. This, no doubt, is the same breeding pair that raised two eaglets in that same nest last year. As a greeter for a number of years at the River “S” Unit of the refuge, the most frequent questions asked about birds are in reference to Bald Eagles. One of those questions is in regards to eagle’s nests on the refuge and their locations. We are fortunate at the refuge to have from six to eight active eagle nests each year. Several of these nests are visible to the general public, as the one behind the Visitors’ Kiosk. The others are in protected areas away from human contact. It is interesting to note that the number of active eagles’ nest in the lower 48 United States has increased 22-fold, from less than 450 in the early 1960’s to close to 10,000 active nests now. No doubt the reason for this tremendous increase was that in 1967 the American Bald Eagle was declared an endangered species. It was only on June 28, 2007 that the Interior Department took it off the endangered species list. The Bald Eagle will still be protected by the Migratory Bird Treaty Act and the Bald and Golden Eagle Protection Act. The Bald Eagle’s scientific name is Haliaeetus leucocephalus. This name signifies a sea (halo) eagle (aeetos) with a white (leukos) head. At one time, the word “bald” meant “white,” not hairless. About half of the world’s 70,000 Bald Eagles live in Alaska and 20,000 of them live in British Columbia. The northwest coast of North America is by far their greatest stronghold and the primary reason is because of the salmon. The female Bald Eagle is larger than the male. She has a body length of around 3 feet. and a wingspread of more than seven feet. Her male counterpart is about a half of foot smaller in both height and wingspread. It takes about five years for Bald Eagles to become sexually mature and for their head and tail feathers to become white. Until that time they are a mixture of brown and white with the young Bald Eagles having a black beak. Sometimes the juvenile Bald Eagle is confused with the Golden Eagle and many sightings of “Golden Eagles” have turned out to be juvenile Bald Eagles. A young bald eagle has more white mottled into its coloration overall than the Golden Eagle; a golden eagle is more solid in color, and its beak is more blue-black with a nearly black tip. Bald Eagles live in the wild for around 30 years. They mate for life although if one dies the survivor will not hesitate to accept a new mate. The eagle’s eye is about the same size as a human eye although its sharpness is four times as great as a person who has perfect vision. Bald Eagles build their nests in large trees near rivers or coasts. A typical nest is around 5 feet in diameter. Eagles often use the same nest year after year. Over the years, some nests become enormous, as much as 9 feet in diameter, weighing close to two tons. In this area of the northwest, eggs are usually laid in March. One to three eggs are usual. The parents incubate the eggs for 35 days and the duties are shared, with the female spending most of the time on the nest. The young eagles (eaglets) grow rapidly and add one pound to their body weight every four-five days. They take their first flight 10-13 weeks after hatching. It is interesting that 40% of young eagles do not survive their first flight. For much more detailed information about eagles and their nesting habits, the raising of their young, migration, and so much more go the web site www.baldeagleinfo.com. 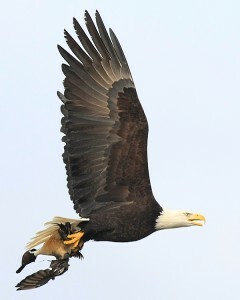 In my view, this is one of the best sites with the most concise information that I have seen on Bald Eagles. 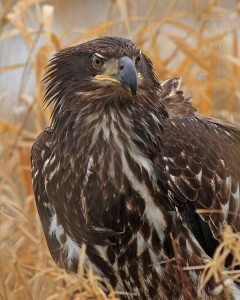 Bald Eagles are common at the refuge in the winter. Listen for the shrill, high pitched call, and the twittering that are common vocalizations of the Bald Eagle. Notice a flock of geese, all of a sudden, erupting into the sky and chances are that an eagle is flying by. Find a good field guide, like Sibley’s, and study the five-year changing coloration patterns as an immature eagle becomes an adult. Find an active Eagle’s nest and observe the care and maintenance that the breeding pair will put into the nest throughout the year and finally watch the hatching and growth of the eaglets through the spring and early summer months. 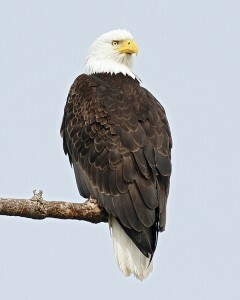 Come and enjoy the Bald Eagles of Ridgefield National Wildlife Refuge. Some of the more unusual and rare birds that have been seen this past month are Snow Goose, Trumpeter Swan, Eurasian Wigeon, Canvasback, Redhead, Sharp-shinned Hawk, Red-shouldered Hawk, Peregrine Falcon, California Gull, Barn Owl, Short-eared Owl, Pileated Woodpecker, Black Phoebe, Northern Shrike, Varied Thrush, and Pine Siskin.